Elaine Ng (吳綺莉) gave birth to Etta Ng (吳卓林) after having an affair with Jackie Chan (成龍) in 1999. Claiming that she never received financial help from Jackie, Elaine first raised Etta in Shanghai before moving back to Hong Kong in 2010. While the mother-and-daughter often dodged speaking publicly about Jackie, it is known that Etta yearns to meet the father she has never known. Despite appearing as a strong single mother, Elaine kept her struggles hidden away. When Elaine’s alcoholism resulted in physical skirmishes with Etta at home, the 15-year-old confided in her teacher, who subsequently called the police in March. The alleged child abuse case brought to light the struggles of Elaine and Etta, and many wondered if their burdens would be alleviated if Jackie had been a more involved father. Agree. Both are as ugly as the father. That is if one can call him “the father” when he had never acted like one. 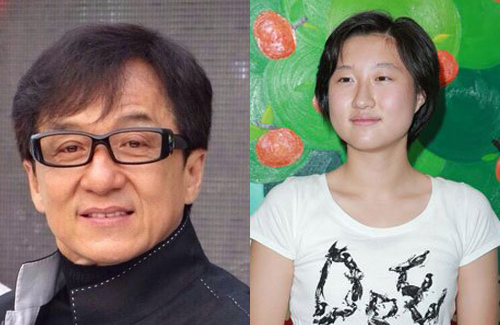 She doesn’t need a father like Jackie Chan. WHY?!?? Curiosity? What a slap to her mother’s face. What is a father anyway? Etta can see her ‘father’ anytime in magazines and in the tell-it-all articles where JC shamelessly brags about himself and his ‘glorious past’ – like it’s something to be so proud about. He’s everywhere except in her life (or his son’s). NO matter how ‘bad’ Etta considers her mother is, or screams out to the world that her mother is alcoholic – her mother didn’t abandon her, and brought Etta up as best as she could. From what is said – it seems despite being alcoholic Elaine does have her daughter’s interests at heart … is pretty strict, and wants her to do stuff any mother would probably nag her child about (like h/w and stuff). It wasn’t an easy life for Elaine either. A more discerning mature and reasonable kid would be able to cut through all her mother’s emotional coping issues (ie alcoholism) at least to realize who it was that stood by her, and raised her up without much support. Regardless of whose mistake it was. Sure, her mom did wrong in having that tryst with JC, but he’s equally at fault for sleeping around as a married man with a family. And worse, not taking up responsibility for it. I recall reading how Elaine set up shop buying this that and those household necessities (clothes rack etc) and mother and then-young daughter carrying it all back home, and even her old car was a loan or gift from Chingmy Yau Suk Cheng. Nor did Elaine choose to abort her, or put Etta up for adoption … (easier ways out of the situation) and choose live life again as a carefree single. Huge difference in responsibility levels. Etta should just stop being a drama queen and wisen up.